Best LEGO and Ultimate Race Car Parties! 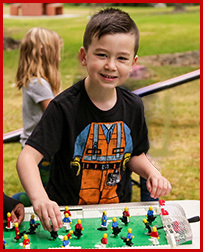 Welcome to the original PLAYPARTY.NET with the 5 STAR YELP RATING providing all of Los Angeles, Orange County and Valley areas with birthday party entertainment featuring the Hot Wheels Ultimate Race Car Party and the Best LEGO party for kids. Please don’t confuse PLAYPARTY.NET with other companies. We have provided children's birthday party entertainment for thousands of amazing families since 1997. We come to your party location (residence, local park, clubhouse, etc.) and we provide excellent children's birthday party entertainment daily. 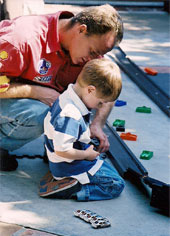 Please explore our web site then contact us with any questions or schedule your next Playparty! Playparty.net is FUN and EASY! WATCH OUR VIDEOS OF PLAYPARTY IN ACTION! Thank you so much for the awesome race car birthday party. All of our guests had a great time, but most of all, Josh, The Birthday Boy, had such a great time that before he went to bed he asked me if we could do it again for his 4th birthday! As a mom, nothing could make me happier. I especially thank you for all of the attention and special care you gave to Josh and friends that day. I think the picture says it all.